A charming family photo album of an extraordinary horse – Snowman – and a family that loved him, HARRY & SNOWMAN is a classic American story. To the children of the family, Snowman was a swimming partner, companion and pet. But to the rest of the world, and to Snowman’s owner Harry deLayers, he was a champion. The two were a perfect match of underdogs. Harry deLayers was an immigrant from Holland who had fled his home country after WWII and the German occupation. He came to America with nothing and a few years later, he bought a horse from a trailer bound for the glue factory. He paid only $80 for Snowman. In the documentary HARRY & SNOWMAN, Harry reflects on his career in competitive riding and his competition history with his friend Snowman. Now 85 years old, his Dutch accent still strong, he has a cheerful and steady demeanor as he recalls story after story about Snowman. Starting in small shows, and graduating to national championships, Snowman’s show career was decorated against all odds. Just a few years after Harry saved Snowman from the slaughterhouse, Harry and Snowman won the 1958 National Championship, the Show Jumping Triple Crown and Horse of the Year. He continued to win, and in the following years he gained worldwide notoriety. There are a few background stories throughout the film – for example, a dose of WWII history is braided into Harry’s story. As a boy, his school was turned into a German concentration camp. And the deLayers family story is also a backdrop to Snowman’s story, including family tragedies and the trials and pressure of following in Harry’s footsteps. Each story is told in a straightforward style: personal interviews, voiceovers, and historic footage. HARRY & SNOWMAN doesn’t blaze any new trails in documentary making, doesn’t offer any cinematic surprises, I don’t recall what the music was like, and the story moves at a leisurely pace. 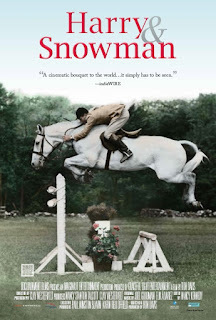 But it’s a heartwarming tale of family and friendship (most especially for equine lovers) – as Harry said, “most people go their whole life and never get a friend like Snowman.” 3 out of 4 stars.